This video is set for SmartPhone viewing. Hit the full screen mode if you wish to see the Skijoring video enlarged. 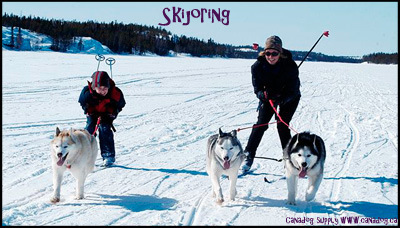 Skijoring is a wonderful winter sport which combines Nordic skiing (XC skiing - cross country skiing) in conjunction with puppy power. The XC skier is attached to their canine friend with a belt and towline and is pulled by their powder hound across the tracked or back-country snow. Originating in Scandinavia, Skijoring literally means "ski-driving" in Norwegian. Skijoring is a team sport between canine and human counterparts to exercise and experience the great outdoors together as one. Mainly used as a mode of transportation for the wintertime in its early years, Skijoring has evolved a bit. Skijoring first began with the skier in wooden skis and, instead of a dog, a horse or reindeer was used for the powerhouse. Eventually skijoring made its way to other countries, including the United States, where it is used today as a means of fun recreation and exercise. Reindeer and horses have given way to dogs as the main choice for this new winter recreation sport. The majority of skijorers are recreational, either on trail or back country. For your typical skijorer, just getting outside with their powder hound team is what it is all about. Treking deschutes county's vast trail system and enjoying all Mt Bachelor has to offer, while getting a great workout for pooch and person. Pacific Sled Dog and Skijor Association has great up to date information on skijoring technique, trail etiquette, local skijoring races, and current trail updates. Check them out and support your local club.